Term Insurance Policy- why do you need it. Term Insurance Policy or Protection Insurance is the cheapest form of Life Insurance available in the market. Term Insurance offer you high value protection on the occurrence of an unfortunate event, and that too at an affordable cost. Term insurance and life stages. This info gram can provide you an idea on how income and insurance coverage requirement varies with age. In the initial years of the career development, income will be low. At the same time, the need of insurance will be high as his family’s expectations are directly co-related to his career. This is the general trend prevailing in every ones life. We can see the purchasing power is low in the initial years. As a result, the best option to get sufficiently insured is through Term Insurance policies. Slowly as he climbs up the career ladder, his income and purchasing power is likely to increase. Consequently, in the later stages of his career, he can afford savings plans, to provide both protection and savings hand in hand. Even-though savings plans are good to accumulate wealth for the future needs, the priority has to be given for a high value Term Insurance, in the initial years of his career. How much Term insurance do I need. Amount of insurance coverage required by an individual varies widely from person to person. It depends on several factors like income, age, nature of job etc. So there should be a method to find out the optimum insurance coverage for a person. The widely accepted method to find out optimum insurance coverage for a person is based on the Human Life Value concept (HLV), developed by Dr. S. S. Huebner. Read more on Human Life Value (HLV) concept. Human Life Value (HLV) Online Calculator is a simple and useful tool to analyse your insurance coverage need in some simple steps. This calculator can give you a fair Idea on the insurance coverage requirement. This online calculator can take into account factors like age, income, expenses, inflation etc. Things to remember before taking a term insurance policy. 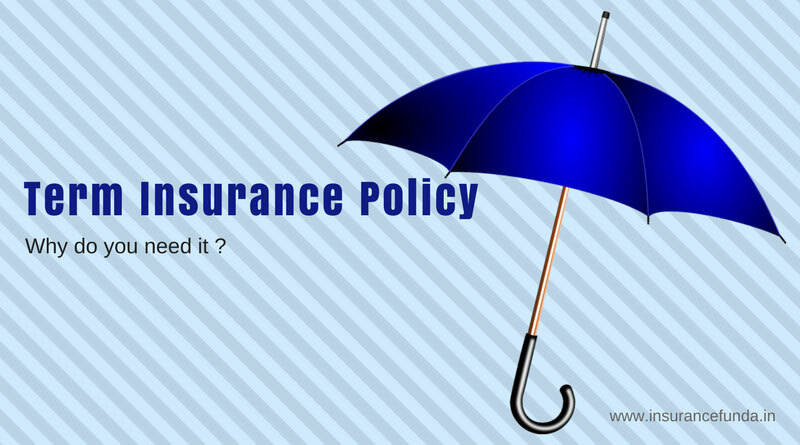 Your Term Insurance policy is a long term contract and hence maximum care has to be taken to ensure that, you have purchased the most suitable policy for you. No need to add that your policy parameters should have a close binding on your needs. Remember the point that, as far as Life Insurance is concerned, it is really hard to rectify a wrong decision or a mistake without incurring considerable financial loss. Consequently, it is always wiser to consider following points before buying a term insurance policy for you. The prime and sole intention behind purchasing a Term Insurance plan is to get insured amount on the unfortunate death of the insured person. No need to add that, track record of the insurance companies in settling the death claims has to be considered as the most important factor, while deciding the insurance company. Read an article on claim settlement ratio and latest comparison of Insurance Companies based on their claim settlement ratio. Notably life Insurance Corporation of India (LIC) the largest public sector insurance company is the clear leader with a claim settlement ratio of 98.33% for the year 2015-16. How long do you require Term Insurance coverage? Term Insurance Policy is intended to protect you and your family from unexpected and unfortunate events. Ideally the term insurance should cover your entire income earning period. Thus for employees, the term insurance policy should cover your entire service period and should end by the period of retirement. On the other hand for business people and people with agriculture income, period can be decided based on following criteria. Analyse your future needs like children’s education, marriage, house construction, dependant family members etc. Try to match the period of your term insurance with these needs. In order to make sure that you are not passing your liabilities to your dependants, it is always advisable to take a term insurance, matching the period of your liabilities. Cost and features of the term insurance plans varies widely between insurance companies. As a result, it is always advisable to have a good comparison between features and premium of term plans by different insurance companies. I will be publishing an article at Insurance Funda soon in this regard. Please remember to subscribe using the subscription box in the right side, to get automatic updates of new posts to your e-mail id. Generally speaking, online term plans are considerably cheaper than its offline counter part. Despite the fact that you will have to complete the entire insurance process by your own, online term policies can help you to bring down the cost of the policy. On the other hand, if you feel that you require the assistance of an insurance adviser to complete and service your term plan, go for the off-line mode. Purchasing your term insurance policy through on-line or off-line mode will not have any binding in the benefits of the policy. At the same time, all efforts should be taken to ensure that you are not missing the renewal premiums of your policy. Which in-turn may nullify your valuable insurance coverage when it is most needed. Income Tax exemptions for Term Insurance Policies. Term Insurance policies as well as savings plans are eligible for Income tax benefits on the premium paid u/s 80 C of income tax act. Maturity proceedings available – if any – from your term insurance policy is also eligible for Income tax rebate u/s 10(10D) of income tax act. Read more on the Income Tax benefits of Insurance Policies. Use Online Income Tax Calculator from Insurance Funda to calculate your income tax liability for any assessment year. E-file your income tax returns using Income Tax Returns e-filing – Step by step guide. What will happen if I don’t die? This could be a question which may hover in your mind when thinking of purchasing a new Term Insurance policy, as the term plans typically do not have any maturity benefit. Point often overlooked is that, you are not taking a term insurance plan to make a profit from it, through your unfortunate demise. Term Life Insurance Policy – Five things you should know. Please feel free to share this article using sharing buttons provided below the post, so that more people can get benefited.